The term Snowball Earth refers to the hypothesis that in the distant past, specifically the Cryogenian period (850-630 million years ago), the earth’s surface was entirely frozen from pole to pole. Evidence of a Snowball Earth comes from the presence of glacial deposits around the world that date back to the Cryogenian period (1). See Figure 1 for a temporal depiction of glaciations. Even though the Snowball Earth hypothesis is generally accepted as the best explanation for the presence of glacial deposits in tropical latitudes and other atypical characteristics of the Cryogenian period, the hypothesis remains controversial amongst paleontologists. Despite the controversy that surrounds the Snowball Earth thesis, the majority of geologists agree that massive glaciations occurred during the Cryogenian period but disagree on whether these glaciations were truly global in nature. Many elements of the Snowball hypothesis existed for decades before the term “Snowball Earth” came into fruition. In 1964, Brain Harland, a British geologist, was the first to provide concrete evidence for glaciers in tropical regions, when he presented palaeomagnetic data that illustrated the presence of glacial tillites in Svalbard and Greenland (3). In addition, Mikhail Budyko of Leningrad Geophysical Observatory devised a climate model, dubbed the “ice catastrophe”, that showed if polar sheets developed sufficiently far away from polar regions, an albedo feedback would become dominant and lead to eventual freezing of the earth (4). However, Budkyo did not think that such a scenario was plausible, as his model could not incorporate an escape from an earth covered in ice (5). In addition, he could not fathom how life would have survived in such extreme conditions. Almost 40 years later, the term Snowball Earth was coined by Joseph Kirschvink, a professor at California Institute of Technology, in a paper concerned with the Proterozoic biosphere (6). In his paper, he explained the presence of banded iron formations and helped infer a mechanism that explained how planetary cooling was maintained by an ice albedo and how the earth was able to defreeze with the accumulation of carbon dioxide from the degassing of volcanoes. But it was the work of Paul Hoffman and a set of distinguished geochemists that made the topic of the Snowball Earth an issue amongst researchers (7). Collectively, this set of individuals were able to expand on Krishvchink’s ideas and create a more encompassing theory but, in doing so, created a more extreme interpretation where the oceans were covered with ice for up to 30 million years (8). The work of Paul Hoffman et al. is particularly attractive as it solves all the paradoxes associated with the Cryogenian period, such as the presence of cab carbonates. In recent years, many in the geology community have voiced increased support for the Slushball Earth hypothesis, developed by Richard Cowen (9). The Slushball Earth hypothesis is less extreme than the Snowball Earth hypothesis. The Slushball hypothesis acknowledges that ice sheets covered large parts of the earth, but asserts that a skeletal layer of ice covered oceans near the equator, enabling photosynthetic organisms to acquire sunlight and survive during these extreme temperatures. Proponents of the Snowball Earth model postulate that the presence of diamictite deposits on every continent points to the fact that a global glaciation had once occurred (10). Lindsay et al. (1996) claim that diamictities with glacial origin from the neoproterozoic have been widespread, and this distribution points to the development of ice sheets. The synchronization of these events strengthens their claim (11). Global distribution of Sturtian and Marinoan (and to a lesser extent the Gaskiers) glacial deposits, and the widespread synchronicity of those in the Marinoan has led some scientists to conclude that glaciers had once covered the entire earth. This widespread distribution of glacial deposits is seen in Figure 2. However, Hoffman and Schrag argue that Neoproterozoic glacial strata do not fit with Phanerozoic stereotypes (14). This argument calls into question the diamicite hypothesis because if the glacial strata do not fit across time period there must be some other reason for the diamicite deposits. Eyles and Januszczak also dispute the diamicite evidence, arguing that the global distribution of diamicite is incorrect because it assumes that deposits are glacially and chronostratigraphically equivalent (18). Due to the increased knowledge of the various ways poorly sorted diamictite can be produced, Eyles and Janusczczak conclude that most Neoproterozoic diamictites are products of deepwater debris flows caused by large-scale continental “unzippings” and are not correlated with global ice ages (18). Other geolocial evidence that supports the Snowball Earth hypothesis are Banded iron formations (BIFs). BIFs are sedimentary rocks that consist of oxides, sulfides, or carbonates of iron interlayered with iron-poor chert (12). These bands are produced when an anoxic ocean reaches the tipping point and becomes an oxygenated ocean. Simonson explains that modern seawater contains less than one part per billion of iron because iron is relatively insoluble in its oxidized form (Fe3+), therefore bands of iron do not form in the modern day (13). The reappearance of BIFs in the Neoproterozoic led Hoffman and Schrag to conclude that widespread glaciations occurred in this period (14). The reemergence of BIFs is shown in Figure 3. Joseph Kirschivink contends that ice sheets had to have covered the oceans because this would allow the deep ocean to become anoxic, allowing the ferric iron (Fe2+) concentration in oceans to rise (1). In order for the ocean to become anoxic, limited exchange with the oxygenated atmosphere had to occur. One possible reason for this limited exchange is that the oceans were covered by a sheet of ice. Once the ice melted the oceans would come into contact with the oxygenated atmosphere and the two could mix, therefore producing Banded Iron Formations (BIFs) (15). BIFs are not uniquely associated with diamicite deposits of the Neoproterozoic era. Williams et al. explain that they are absent from many diamicite deposits and hypothesizes they occurred before or after the Neoproterozoic deposits were made (19). 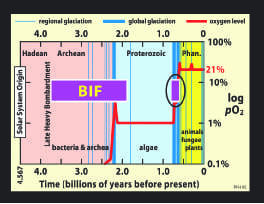 The finding that BIFs are also found interspersed in glacial sediments makes it hard to conclude that they formed after Snowball Earth melted (20). Eyles et al. claim that there is no genetic or temporal link between the formation of banded iron sedimentary rocks and the melting of Snowball Earth. As a counter theory, they posit the idea that hydrothermal activity in rift basins after the breakup of Rodinia could have caused banded iron formations (18). 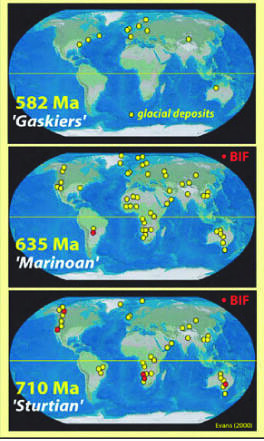 Figure 3: Distribution of banded iron formations (BIFs) and their temporal relation to glacial epocs. Supporters of the Snowball Earth model argue that the presence of Cap Carbonates in the geologic record supports their hypothesis. Cap Carbonates are layers of limestone and/or dolostone that sharply overlie glacial deposits (14). In the aftermath of the Sturtian and Marinoan glacia-tions, cap carbonates are found globally on the continental margins and inland seas. For example Saylor et al. looked at carbonates in Australia and concluded the cap carbonates were deposited in a period of post glacial transgression; James et al. suggest the same for cap carbonates in North West Canada (15,16). Eyles and Januszczak explain that when global ice sheet melts, evaporation adds water vapor to earth’s atmosphere, which leads to a rise in CO2. 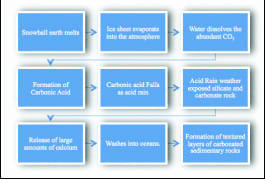 The hydrologic cycle coupled with carbonic acid would work to weather rocks, creating a runoff rich in cations and bicar-bonates, that would flow to the oceans and cause the precipitation of inorganic carbonate sediments, thus creating cap carbonates (17). This series of events is presented in Figure 4. The presence of cap carbonates in the stratigraphic record does not provide conclusive evidence for the Snowball Earth hypothesis. In fact, Kumpulainen and Nystuen note that cap carbonates are not present above definitely glacially influenced deposits in Baltica (21). 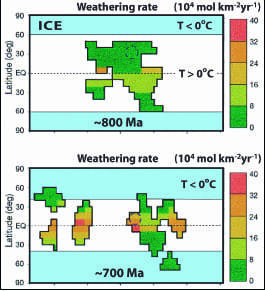 Eyles and Januszczak argue that the link between carbonate deposits and glacial melting has no definitive temporal or genetic relationship (18). Paleomagnetism, the study of Earth’s magnetic field over time by looking at rocks, was first used to verify the theories of continental drift and plate tectonics; however, it can also be used to support the Snowball Earth hypothesis (12). Essentially, magnetic minerals within a sedimentary rock will align with Earth’s magnetic field. By looking at this alignment over time, it is apparent that this magnetic field has changed. This allows paleomagnetists to estimate the latitude of a rock when it was formed. Macouin et al. looked at isotopic signatures and the paleomagnetism of Doushantou carbonates in South China and found that the likely location for these was 3±4.5°N (26). Other studies have found that rocks from Late Neoproterozoic would also have been situated at low latitudes. The finding of glacial deposits at these latitudes lends evidence to support the theory of global Neoproterozoic glaciations. Opponents of this data, however, question the accuracy of the reconstruction because it is hard to determine if a magnetic signature is original, or if it was reset by later geologic activity, such as mountain building orogeny. Alternative hypotheses, such as the “Zipper Rift” hypothesis and the high-obliquity hypothesis, have been offered as possible explanations to the scientific community of the previously observed data. Figure 5: Normal fluctuation of Earth's obliquity over time. As stated by Eyles et al., the “Zipper Rift” hypothesis suggests a link between the re-organization of Earth’s surface caused by the rifting of Rodinia and the climatic effects that would have occurred because of the uplifted rift flanks (17). This hypothesis states that there were two vital rifting events, the breakup of Rodinia and the splitting of Baltica from Laurentia, that can be recorded by looking at ‘tectonostratigraphic’ successions that were deposited in marine rift basins (17). Eyles et al. also suggest that the high ground of the rifts could support glaciers; however these glaciers were likely regional or hemispheric in scope. It has also been suggested that inland seas, much like the Black Sea, could be stagnant and anoxic at very deep depths, leading to BIFs. The continental rifting events proposed by Eyles et al. would allow for inland seas to form and this would explain the limited extent of the BIFs found during this period of time (17). Another alternative hypothesis, the high-obliquity hypothesis, is a response to the idea that the Snowball hypothesis does not account for seasonal temperature changes at paleo-latitudes near the paleo-equator (26). 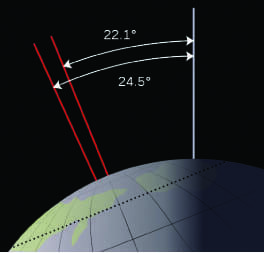 A high obliquity, or axial tilt, of the Earth would result in the equator being cooler than the poles. This change in obliquity could have resulted from a single giant impact 4.5Ga. It is also possible that Earth’s magnetic pole simply wandered to this particular inclination. The high-obliquity hypothesis would allow for a fully functional hydrological cycle and long-lived open seas; however there is currently minimal evidence to support this hypothesis (26). The normal fluctuations in Earth’s obliquity are seen in Figure 5, but if the obliquity was higher at the time that ice sheets were present it would possibly explain why certain Snowball Earth-esque events occured. While the absolute cause of the initiation of the Snowball Earth event is not known, many theories have been proposed. These theories include a solar output decrease, the Earth passing through rare space clouds, or even a runaway cooling effect due to a decrease in greenhouse gases. However, many scientists believe that a combination of these factors could be the real reason the Earth became covered in ice. The newest of these theories proposes the Earth became covered in ice while passing through a rare space cloud. The support for this theory is limited; however it states that the dense space clouds would have allowed charged particles to enter the Earth’s atmosphere and destroy the ozone layer (25). Pavlov suggests that in combination with dust that would collect in the atmosphere as a result of this event, solar radiation would scatter and not be absorbed, allowing heat to escape into space. This would eventually cause a runaway ice effect and possible global glaciation (25). By assessing levels of uranium 235, geologists can test this hypothesis. Uranium 235 is not produced naturally on Earth, or anywhere else in the solar system, but is very readily produced in exploding stars called supernovae. These supernovae are found in space clouds. A higher level of uranium 235 during the Snowball Earth period would support this hypothesis. However, opponents to this theory argue that it would take the solar system 500,000 years to completely pass through a space cloud, the Earth’s magnetic fields would likely switch during this time, allowing the sun’s charged cosmic rays and ultraviolet radiation into the atmosphere. A second and more accepted theory for the initiation of the Snowball state suggests the Earth froze because of a lowering of greenhouse gases, such as CO2 and CH4. Carbon dioxide is moved throughout the Earth by a process called silicate weathering. This process is faster in hot, wet environments and slower in cool, dry environments (24). Prior to the Snowball event, the continents were located around the hot, wet tropics, speeding up silicate weathering around the globe. This increase in weathering lowered CO2 concentrations, thus lowering the amount of greenhouse gases present; this would lead to a decrease in the temperature of the Earth and eventually to a global glaciation (24). The breakup of the supercontinent Rodinia caused much more land to be exposed to the sea, thus increasing the weathering rates on all of the new continents, further leading to a decrease in the carbon dioxide concentration. For the extent of weathering rate increase, see Figure 6. The levels of another greenhouse gas, methane, are inversely related to the levels of oxygen. In the early atmosphere there was much more methane than oxygen, which was approximately less than 1 percent of the present atmospheric oxygen level (14). This high level of methane created a very strong greenhouse effect on the early climate, offsetting the lower solar luminosity Earth faced. As oxygen levels began to rise, there was a rapid loss in methane from the atmosphere, freeing Earth from greenhouse warming and adding to the decrease in Earth’s temperature. The cause of this sudden increase of oxygen is not known for certain, but the most likely cause, is the evolution of oxygenic photosynthesis (24). As these greenhouse gases are taken from the atmosphere a vicious circle ensues in the form of the “reverse of a greenhouse effect,” states geologist Philip Allen (23). An albedo feed-back would occur when half of the Earth’s surface is covered in ice. Hoffman states this would lead to the plummeting of Earth’s surface temperatures and ice would begin to cover the oceans (14). Although this cycle seems self-sustaining, it can be and was broken. The Earth freed itself from this state by releasing small amounts of carbon dioxide back into the atmosphere over long periods of time. Plate tectonics were the main factor for the Earth heating and coming out of a Snowball Earth event, as they are the driving force behind volcanoes being formed. Volcanoes would release small amounts of carbon dioxide, causing a greenhouse effect (24). Once the oceans are free of ice, the ice-albedo feedback would cause deglaciation (14). It is believed that the effect of a Snowball event on the biosphere of Earth would have been catastrophic. This belief is supported by evidence that indicates the carbon-isotope ratios of carbonates from this period are the same as those of Earth’s mantle, implying that photosynthesis and most eukaryotic life was effectively eliminated (7). However, Corsetti et al. have shown that microfossils from the Neoproterozoic Kingston Peak Formation contain prokaryotes, but also eukaryotes (27). This evidence suggests that life was not only able to survive, but also adapted to live in shallow-water carbonate environments. These fossils were located above a BIF, therefore it is assumed the microbiota existed during or after a Snowball event. In addition, the fossils found are similar to those found in rocks that immediately predate the glaciation event, further suggesting life survived this event (27). One possible way life could have remained is by colonizing a more tolerable environment. It is known that anaerobic bacteria survive and flourish near hydrothermal vents deep within the Earth’s oceans, so it is likely bacteria could survive in the same location during a global glaciation event. Adaptations required for living in such an environment include the ability to convert heat into energy. However, photosynthesis is not possible at these locations because light does not penetrate that deep in the ocean. It was previously believed that thin ice or cracks in the ice during the Snowball event would allow for photosynthesizers to survive and produce trace amounts of oxygen that could be used by oxygen-dependent organisms (depicted in Figure 7). While this is still a possibility, a concurrent hypothesis for survival has been proposed. After analyzing samples of phytoplankters from different geothermal waters, Costas et al. concluded that geothermal waters were very hazardous to cyanobacteria and microalgae because growth in these waters was not detected (28). However, by looking for rare variants that flourished under these conditions, they found this response was due to a single, spontaneous mutation. While there is no way to be certain if algae during the late Neoproterozoic had a similar mutation, it is possible they may have survived in ice-free geothermal waters by using a similar mutation mechanism (28). From the standpoint of early animal evolution, there are three possible effects of the Snowball Earth model. The first effect would occur under conditions of a prolonged frozen ocean surface and would result in a mass extinction with eukaryotic survivors being mostly terrestrial in origin (29,30). However, this type of extinction would not be seen in the terrestrial fossil record. 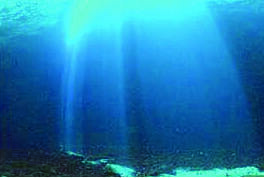 The second possible effect is often referred to as the blue-water refugium. This hypothesis suggests that early metazoans could have survived in some kind of “larval mode” that is similar to the resistant spores that are formed by many bacteria today. However, this limited pelagic environment would not allow for the survival of phytoplankton without an active hydrological cycle. Extreme conditions in the polar regions of Earth today allow for the survival and diversification of life, mostly by life alternating between active and inactive forms. This third uniformitarian outcome may allow for a broader view to be taken on how life could survive in extreme conditions. Unfortunately, the communities seen today alternate between lifestyles during a relatively short time period (hundred, maybe thousands of years), therefore an exact comparison cannot be drawn (30). Figure 7: Cracks in ice sheet. While the Snowball Earth hypothesis is accepted by most scientists as the best explanation of certain characteristics of the Neoproterozoic era, such as glacial deposits at low latitudes, cap carbonates, and BIFs, there is still controversy over the accuracy of the hypothesis. Opponents of Snowball Earth claim the model fails to account for temperature changes or a fully functional hydrological cycle, and have found alternative explanations of the characteristics that proponents claim supports the model. Stephen Warren, a professor at the University of Washington, is currently attempting to find data to support the Snowball model by analyzing the albedo, or reflectivity, of different types of ice found in Antarctica; he believes these ice types were found in the tropics during the Snowball event (31). While the study is ongoing, this current work in the field shows that the Snowball Earth model is just a hypothesis that has yet to be shown absolutely correct. More work in the field is crucial to settling this hot debate. Research was conducted under the mentorship of Dartmouth earth sciences professor Mukul Sharma. 1.Kirschvink J.L., 1992, Late Proterozoic Low-Latitude Global Glaciation: The Snowball Earth. Section 2.3 in: J.W. Schopf, C. Klein, & D. Des Maris (eds), The Proterozoic Biosphere: A Multidisciplinary Study. Cambridge University Press, pp. 51-52. 2.Allen, P.A. and Etienne, J.L. 2008. Sedimentary challenge to Snowball Earth. Nature Geo-science, 1, 817-825. 3.W. B. Harland (1964). “Critical evidence for a great infra-Cambrian glaciation”. International Journal of Earth Sciences 54 (1): 45-61. 5.M.I. Budyko (1969). “Effect of solar radiation variation on climate of Earth”. Tellus 21 (5): 611-1969. 6.Kirschvink J.L., 1992, Late Proterozoic Low-Latitude Global Glaciation: The Snowball Earth. Section 2.3 in: J.W. Schopf, C. Klein, & D. Des Maris (eds), The Proterozoic Biosphere: A Multidisciplinary Study. Cambridge University Press. 8.Harland, W.B. (2007). “Origin and assessment of snowball Earth hypotheses”. Geology Magazine 144 (4): 633. 9.Cowen, Richard. Planktonic Paradise on Slushball Earth: a Scenario for the Metazoan Radia-tion. http://www-geology.ucdavis.edu:8000/~gel3/slushball.html. 10.Lindsay, J.F., 1989. Depositional controls on glacial facies associations in a basinal setting, Late Proterozoic, Amadeus Basin, Central Australia. 205- 232. 11.Lindsay, J.F., Brasier, M.D., Sheilds, G., Khomentovsky, V.V., BatIreedui, Y.A., 1996. Glacial fa-cies associations in a Neoproterozoic back-arc setting, Zavkhan Basin, Western Mongolia. Geol. Magazine. 133, 391- 402. 12.Stanley Earth Systems History p 41. 13.Simonson, B.M., 1985. Sedimentological constraints on the origins of Precambrian iron-formations. Geological Society of America Bulletin. 96,244- 252. 14.Hoffman, P.F., Schrag, D.P., 2002. The Snowball Earth hypothesis: testing the limits of global change. Terra Nova 14, 129- 155. 15.Saylor, B.Z., Kaufman, A.J., Grotzinger, J.P., Urban, F., 1998. A composite reference section for terminal Proterozoic strata of southern Namibia. 1223-1235. 16.James, N.P., Narbonne, G.M., Kyser, K.T., 2001. Late Neoproterozoic cap carbonates: Mackenzie Mountains, northwestern Canada: precipitation and global glacial meltdown. 1229- 1262. 18.Williams, G.E., Schmidt, P., 2000. Proterozoic equatorial glaciation: has ‘Snowball Earth’ a Snowball’s chance? 21- 25. 19.Young, G.M., 1995. Are Neoproterozoic glacial deposits preserved on the margins of Laurentia related to the fragmentation of two supercontinents? 153- 156. 20.Kumpulainen, R., Nystuen, J.P., 1985. Late Proterozoic basin evolution and sedimentation in the westernmost part of Baltoscandia. In: Gee, D.G., Sturt, B.A. (Eds. ), The Caledonide Orogen, Scandinavia and Related Areas. Wiley, London. 22.Schirber, Michael. “Snowball Fight Erupts over Frozen Earth Theory.” Live Science. 06 May 2007. Web. 01 Mar. 2010. <http://www.livescience.com/environment/070506_snowball_earth.html>. 24.Cook-Anderson, Gretchen, John Bluck, and Jim Scott. “NASA – NASA Study Suggests Giant Space Clouds Iced Earth.” NASA. 03 Mar. 2005. Web. 02 Mar. 2010. <http://www.nasa.gov/home/hqnews/2005/mar/HQ_05066_giant_clouds.html>. 27.Corsetti FA, Awramik SM, Pierce D. A complex microbiota from snowball Earth times: microfossils from the Neoproterozoic Kingston Peak Formation, Death Valley, USA. Proc Natl Acad Sci U S A. 2003 Apr 15;100(8):4399-404. Epub 2003 Apr 7. 28.Costas E, Flores-Moya A, López-Rodas V. Rapid adaptation of phytoplankters to geo-thermal waters is achieved by single mutations: were extreme environments ‘Noah’s Arks’ for photosynthesizers during the Neoproterozoic ‘snowball Earth’? New Phytol. 2008;180(4):922-32. Epub 2008 Sep 18. 29.Kirschvink JL, Gaidos EJ, Bertani LE, Beukes NJ, Gutzmer J, Maepa LN, Steinberger RE Pa-leoproterozoic snowball earth: extreme climatic and geochemical global change and its biological consequences. Proc Natl Acad Sci U S A. 2000 Feb 15;97(4):1400-5. 30.Moczydlowska, M. The Ediacaran microbiota and the survival of Snowball Earth condi-tions. Precambrian Research. 2008. 167 (1-15).